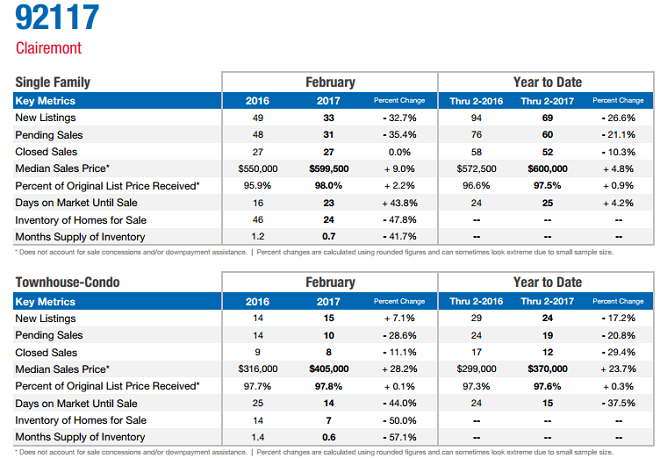 San Diego County’s housing market report has some good news and bads this month. 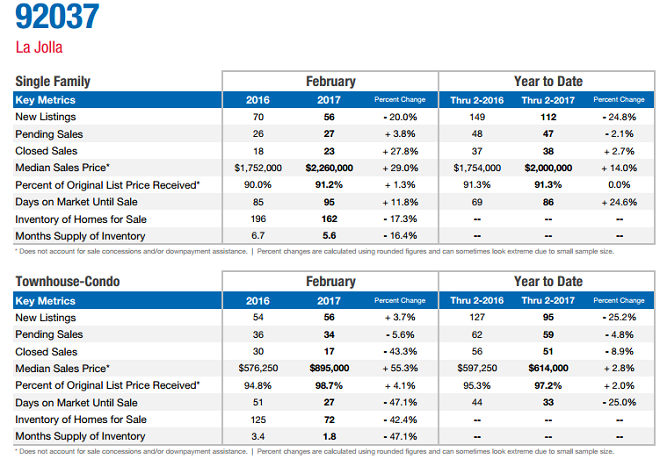 Across San Diego County, overall inventory was up 36.9%, attached homes up 11.3%, and condos are up 55.9%, and the inventory of homes for sale rose an amazing 30%. The bad news for buyers however, is prices are still rising (up 8.1% YoY) to average of $824,973. That’s brought sales down 10.3%. Pending home sales in the lower tiered segment are down 20.7%. Inventory of large, million dollar homes rose almost 8% and sellers are getting 94% of list price. Affordability is predicted to worsen in 2019. The fact is, San Diego County remains one of the most desirable cities in California to live and do business. San Diego’s housing market remains one of the hottest in the nation (ranked 10th by Zillow). Rents are predicted to rise 8.4% and properties are forecast to rise 4.7%, so buying is looking to be the right investment decision. Overall, the California housing market and US housing markets are still positive. Supply is growing, and interest rates may flatten, so buyers will have opportunity. January’s jobs report was very good. Right now might be the best time to buy, before the economy really picks up pace again. The news coming out of the media really is unjustified. 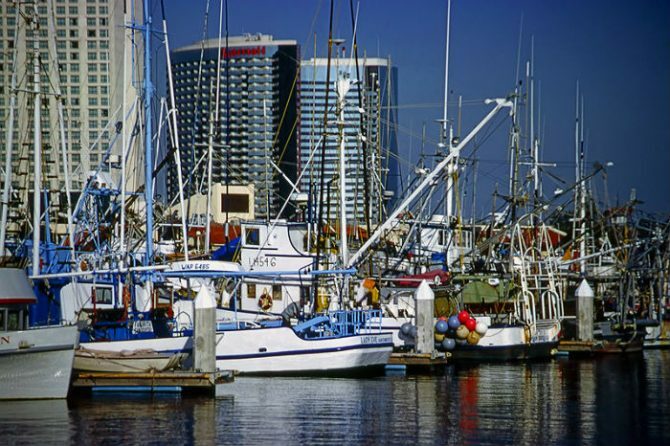 The cost of living and doing business in California are high which is resulting in outmigration. That should help to moderate home prices. Home Prices in San Diego – Screen shot courtesy of SDARSan Diego’s gorgeous climate, wonderful lifestyle, along with the improving California economy, increased immigration of workers here, beefed up military spending, and proximity to Mexico means San Diego County’s home and condo sellers are going to have it good in 2019. According to CAR, San Diego County had one of the lower rates of price growth and sales. A look back at last summer: The average income for San Diego households grew 5.6% to $71,481 per year and unemployment is down to 3.1%. California had another strong month of job growth, adding 44,800 positions in the latest numbers from the Economic Development Department. In year-over-year terms, from August 2017 to August 2018, California’s job growth rate (2.1% or 348,900 jobs) has outstripped the nations (1.6%). Unemployment stayed stable at 4.2% — from report in Beaconecon. This graphic below courtesy of Zillow, shows they predict home prices will grow $50,000 over the next year. Last July, SD county did see a loss of jobs, with employers stating they can’t find qualified workers, and some suggest SD’s and California’s economy is in a lull. Is this due to the trade uncertainties in the US? What will the effect of the 25% Chinese trade tariffs be on San Diego? Does San Diego need Asia to excel? Will military spending offset? Lot’s of reasons to love San Diego, with so much to do with its beautiful climate. Selling San Diego during the winter of 2019, to cold northerners is easy. Visit San Diego Magazine to learn more about activities, local culture and the people of SD County. If you’re selling an upscale home in SD County, Dream Homes Magazine is the premier way to showcase the value and prestige of your property. What’s San Diego’s achilles heel? Lack of housing development and urban intensification. Another problem might be politicians trying to suppress growth in this little piece of heaven. But San Diego’s smack dab in the middle of everything. They’ll be under extreme pressure to stop the resistance and net migration into SD County. In the face of huge demand, politicians will be under the gun about putting the Kibosh on SD’s amazing real estate fortune. This factor will ensure prices will rocket out of control. Are local SD County politicians and the California government doing much to grow housing developments inland? Will the exodus of illegal Mexicans ease the issue? Are illegals buying homes? Demand for homes in San Diego County will never subside. It is one the best places on earth and prices will stay high. For homeowners here, it is on of those infrequent opportunities to cash out and make a killing. You only need a dream and somewhere to go. Here’s an easy to understand Forecast of San Diego’s real estate future. High homes are driven by the California housing shortage crisis. Because of that, we’ll see big home prices right through the spring. The same outlook applies to Los Angeles, Orange County, San Jose, Sacramento, Oakland, and the San Francisco Bay Area. This graphics below shows housing is in short supply and affordability is plummeting. It’s an emergency situation that forecasts big rent increases and strong home price growth. Since home building takes time especially in a heavily regulated environment, there’s little chance of diminished demand. With incomes increasing and millennials coming into their family building years, the stage is set for rocketing prices. This excellent chart below courtesy of First Tuesday, shows how demand for lower priced properties is almost a separate world. It’s this more steep tier that is most likely to see huge price growth. Will this turn into a San Diego housing bubble as part of a US housing crash? The 2007 real estate crash saw big drops in luxury home prices in SD and this time around, we have to wonder if foreign money will vacate fast if the market heads downward. My opinion is that California and San Diego are pretty strong and there’s no other compelling destination for foreign money. It’s an excellent opportunity for rental property investors who want to capitalize on the severe housing and rental property shortage. Property owners near the I5 with waterfront views in La Jolla, Del Mar, Claremont, Solana Beach, and Encinitas may not have much to be concerned with. As long as the Trump economic surge continues, San Diego’s outlook should be bright. Should I Sell My San Diego Home? When is the best time to sell your home in San Diego? Spring of 2019 is the ideal time to buy a home. However, if you’re a little more pessimistic about the fall of 2020 (elections), then selling soon might be wise. This holding onto property is happening all over North America. To ease this housing crisis, governments could offer incentives for home sellers to let go of their property. For sure, new housing will not ease this crisis. What will make a difference is Realtors convincing people to sell their homes and move on with their lives. The housing shortage is a global phenomena, not just in San Diego. All the in demand cities are seeing foreign that’s fleeing other countries boost up prices in New York, Palm Beach, Toronto, and Miami. The new problem we may face is a shortage of construction workers, which could raise construction costs. That will put upward pressure on resale home prices. Considering Buying or Investing in Real Estate in San Diego? With the new Trump Era fully engaged, job growth will pick up steam in Southern California. This will drive growth in places like Escondido, Del Mar, Oceanside, Carlsbad, and San Diego. 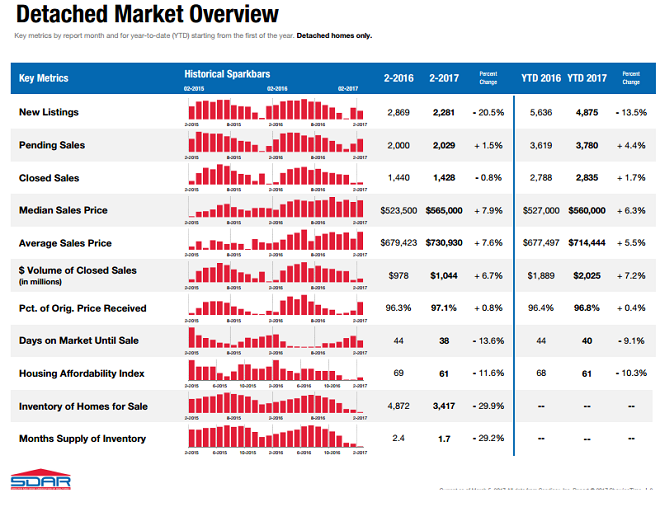 Take another look at San Diego’s historic price chart courtesy of SDAR. Detached home prices are up $300,000 in the last 4.5 years. Many experts are commenting more on a possible housing crash, which would include San Diego however the economy is too strong and homeowners will get a better price as wages rise. If you’re thinking of selling, this might be the best time to contact a San Diego Realtor and begin the process. There is no vertical price rise on the graph, or glut of first time buyers with underwater mortgages. My guess is that we’re in for good times for a while in San Diego. Please do review and share the 2018/2019 Los Angeles housing report , San Francisco housing report and Sacramento reports for info on California’s housing demand. Case Shiller’s home price index for San Diego is 229 compared to the national average of 185. About Business: Should San Diego be a Startup Haven? Forbes published their top cities for startups report and they chose San Diego as the best place to launch a new business. You probably wouldn’t get too much argument that a medical and security software startup would thrive here, but is SD better than silicon valley at anything else? Blair Giesen of Thevoiceofsandiego.com is a little skeptical that investors are here and that San Diego is a tech hub. But don’t tell that to San Diego Startup Week who just had their 5 day convention. And conventions are one big advantage San Diego does have. San Diego Has All the Charm and a Good Economy – But are You Communicating That Well Enough? California was just named the 5th largest economy in the world and it’s had a great year in 2016. That’s amazing, but does San Diego’s small business and startup growth compare to that of LA and silicon valley? Some of the data below suggests that despite growth in manufacturing and professional services, talented workers may not want to move to SD county. With the Trump presidency firmly launched, San Diego, San Francisco and Los Angeles may be headed for boom times. 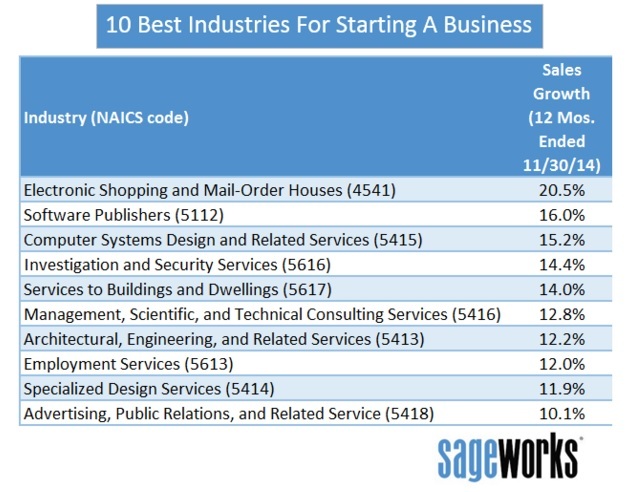 Which industries are best for startup businesses in San Diego? Should San Diego Chamber of Commerce and San Diego Regional Economic Development be doing more? 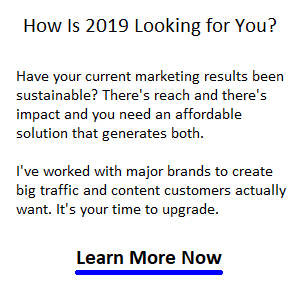 Although some startups have found success, it isn’t easy to succeed especially in digital marketing against tough competition. Companies would be wise to get connected with companies and investors in other cities, perhaps Canada or the UK to build a wider base of success. By networking and accessing those components that don’t and never will exist in San Diego, SD might be able to compete equally with LA, NY, Boston and Silicon Valley. What shouldn’t be underestimated is the desire of companies in Vancouver or Toronto or London to work with SD companies. Motivation is a key factor in performance. San Diego’s wonderful leisure climate and opportunities are a powerful draw to bring smart talent, business entrepreneurs, and investors from around the world. All that’s needed are people who believe in San Diego! Should SD be Leveraging the 4 Pillars instead of Leaning on Them? 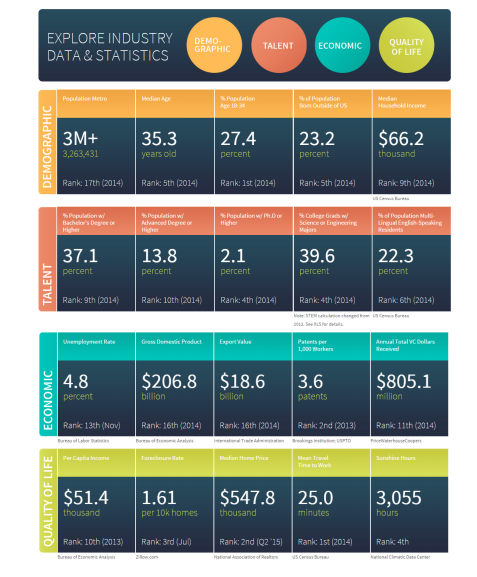 San Diego has 4 key industries including maritime/naval, healthcare, tourism, and research. Although US naval fleets and operations are the biggest engine of business and tax revenue in San Diego, the future of war doesn’t look good. If defense budgets stay at current levels, that’s fine, but San Diego needs to grow and diversify to generate greater opportunity, investment and of course jobs. According to dot.ca.gov, in 2012, most employment sectors in San Diego enjoyed job growth. And the city’s current 4.2% jobless rate is extraordinary. Most cities can only dream of that. The largest gains occurred in professional services (+5,700 jobs), leisure and hospitality (+5,400 jobs), and retail and wholesale trade (+4,500 jobs), and education and healthcare (+4,300 jobs). The only sector that lost jobs was government (-1,400 jobs). 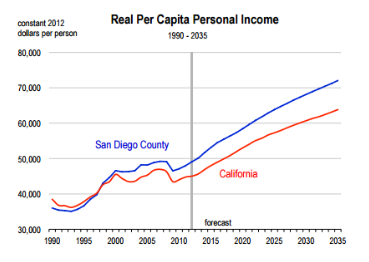 Compare SD’s per capital income growth to San Francisco’s pictured here at right, and you can expect more skilled, creative talented IT related workers to choose Palo Alto and Mountainview rather than San Diego to work and live. But for startups, it might be better to stick to Toronto (see Entrepreneur.com’s vote), Vancouver or Charlotte. Boston, LA, San Francisco, and Silicon Valley are expensive. And Sergei Brin of Google agrees. From 2016 to 2020, SD’s population will grow about 180,000 and per capita income will grow about $4,000 to an average of $58,428. The professional services sector will see the strongest job growth in total of more than 20,000 new jobs. 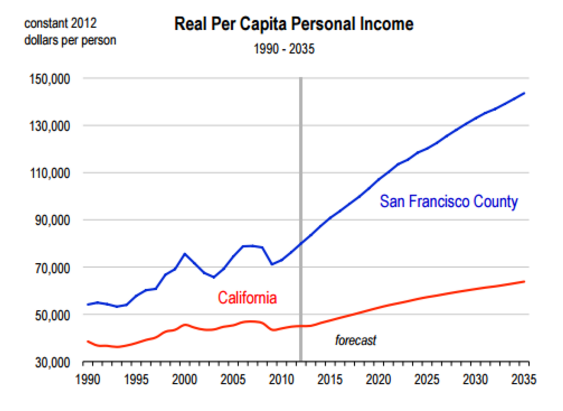 And in this graphic at right, we discover that per capita income will rise much faster than the California average (other CA counties will do much better). High wages in San Francisco, Palo Alto, Mountainview, Santa Clara, San Jose will draw high skilled IT workers like flies. However the Bay Area is pricey and the cost of doing business there will eat away at capital and profits. Silicon Valley looks to India for alleys but Donald Trump might throw a monkey wrench into their machine. REAL ESTATE: High volumes of sales and soaring home prices indicate that compared to the rest of the nation, California metros are benefitting from strong housing sector growth in 2013. San Francisco is considered by some to be the strongest market in the country, closely followed by several other California metros including San Jose, Sacramento, Orange, and San Joaquin Counties. Where will you find San Francisco apartments for rent? Are you looking for the best cities to invest in real estate in 2019? Where is the best Vacation destination: Costa Rica or San Diego? Is this he right time to sell your home? Reports suggest people don’t intend to sell their homes so what impact will that have on the US housing construction forecast? How will first time buyers ever get the mortgage financing they need to buy?